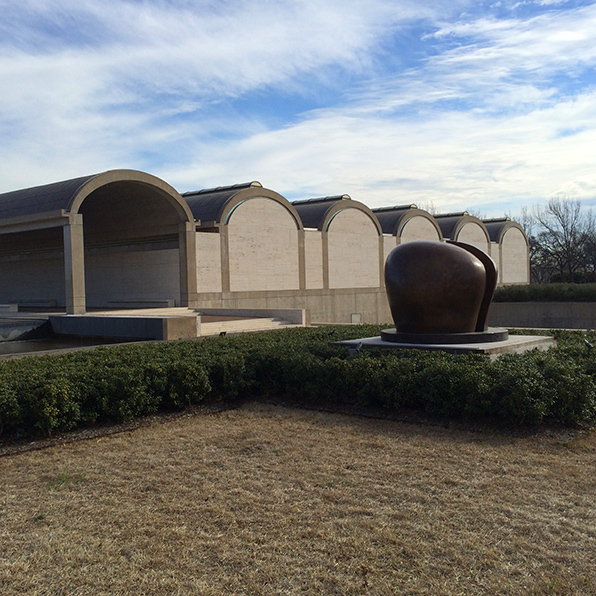 Designed in 1967 and completed in October of 1972, the Kimbell houses the life-long collecting efforts of Kay and Velma Kimbell consisting largely of old master paintings and sculpture. The building was designed specifically to house this kind of work and the sympathies between the art and architecture are remarkable. The soft and warm color and texture of the interior travertine walls lends a richness and solemnity to the hanging of the art that doesn't overwhelm the pieces but is a far cry from the typical generic white walls of most museums. The museum is composed of a series of elliptical concrete barrel vaults with a long, curving light shade running down the top center of each bringing in natural light and modulating it across the texture of the concrete skin. The building is a single story, in keeping with an agreement with a neighboring institution to limit the building to no more than 40 feet high, and this horizontal expanse echoes the predominantly flat Texas landscape, placing the museum on the earth. The building does not feel like the typical urban arts institution, but rather the horizontality and the infusion and filtering of the harsh Texas sun creates a building that is a unique collaboration of old master works and Western landscape. Kahn's works are always beautifully and simply made. I have spent a lot of time in the British Gallery and the Yale Art Museum, both Kahn works, and frankly had grown used to seeing his typical composition of wood flooring, travertine panels, and concrete structural elements. But the Kimbell brings this together in way more subtle and elegant than his other works. Maybe it is the quality of light in this building that reveals these materials and their affinities for each other, in a way both startling and timeless. Especially noted is the use of travertine, as both a wall and flooring material, that is so sympathetic with the traditional works of art but that avoids a kind of cloying historical allusion or references. Handled in large slabs, most often brick-coursed, the travertine seems to add this building to that list of ancient and timeless stone buildings that make up the core of Western architecture and projects that canon into the future. I was interested in seeing this building again after so many years and I was frankly blown away by how really amazing it is. As architects we strive on every project to bring together a great number of things - a program of use, materials, light, the surround landscape, etc. - into a cohesive whole. Executed well, a great building feels like a single perfect idea. On a day-to-day basis, the effort it takes to "make it look easy" is monumental and we usually miss the mark. When you visit a building like the Kimbell, where everything seems to come together so effortlessly, so gracefully, it forever changes the aspiration of what a building can be.